Marqués de Murrieta is a 160 year old winery that is deeply rooted in tradition, yet has developed and adapted to modern times. This is still a family run business that has been successful thanks to hard work and dedication. 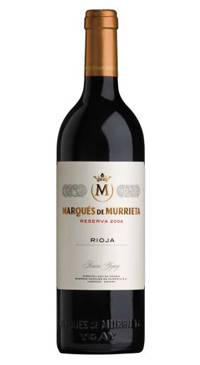 Marques de Murrieta is a beloved producer at home in Spain and abroad. Much of the quality of the Marqués de Murrieta wines is determined by the character of the Ygay Estate, 300 hectares of estate owned vineyards located around the winery, which allow the absolute control of the raw material. Located in the south of Rioja Alta, it enjoys a privileged continental climate tempered in the north by the Sierra de Cantabria Mountains. Made from Tempranillo, Garnacha and Mazuelo, aged 17 months in 225 litre American oak barrels and a minimum of 12 months in bottle before release. This wine shows ripe fruit and aromas of sweet vanilla and spice from barrel ageing. Balanced acidity, tannin on a supple silky palate. The finish is long with flavours of herbs, red fruit and sweet spices.